is a math and science writer, and a contributing editor at Discover. Her work has appeared in Science News, Wired and New Scientist, among others. She lives in Santa Fe, New Mexico. I spoke with my father only once that I remember. I was 18, and it was the fall of 1990. I knew his name, I knew that he’d once lived in Houston, and beyond that, I knew almost nothing. I called information, and the operator rattled off my father’s number. My hand shook as I wrote it down. I dialled it over and over, hanging up two digits short, then one digit short, then just after finishing the number. Finally, I allowed the phone to ring. ‘Hello?’ a man’s voice answered. ‘Is this Don?’ I asked. ‘Unnnh-huh,’ my father said. I wasn’t sure what kind of response I’d expected, but it wasn’t that. ‘Unnnh-huh,’ he said, his voice as flat and closed as the first time. I struggled for something to say next. Then, to my relief, he asked me a couple of questions, banal things like where we were living. I mentioned that my mother was sick, maybe dying. ‘OK, bye!’ I squeaked, hanging up the phone as fast as I could. A few months later, I heard that he’d died. He was 61. Any chance to know or love my father, it seemed, had died with him. When I was in my early 30s, I typed the name of one of my father’s older, legitimate children, Wes, into Google. I called him up and left a message saying that I was a family member trying to get in touch. A few hours later, I got a call from a very stunned Wes: having had no idea who I might be, he’d asked his maternal uncle, who told him that his dad had had an affair with my mother in the years after Wes’s youngest sister, Tricia, had been born, and yes, there had been a child. Wes had never suspected it. Although his parents had separated a few months before his dad died, Wes had seen their long marriage as a mostly happy one. We exchanged some basic information, and I felt a tentative warmth from him trying to burn its way through his shock. Some months later, after more phone calls and emails, I visited him and his sisters in Austin. I knocked on the door of a giant tract house and a tall, beaky man opened it. ‘I’m not quite sure what to do here,’ Wes said, ‘but I guess I should give you a hug,’ and he wrapped me up. Wes sat me down at his kitchen table and pulled out the photo albums. For the first time, I saw a picture of my father, taken not long before he died: a greying man with a high round belly and heavy-browed, deep-set, squinty eyes. My eyes, only grey. When Tricia came into the room, her eyebrows flew up: our eyes were mirror images of one another, like his but dark. ‘I guess you are my father’s daughter!’ she said. They began telling me stories, stories of my father, coming from these people I’d just met. Someone mentioned his favourite brownies, with caramel in the middle: I knew those brownies! When my mother made them, it had been my job to unwrap the Kraft caramels, cellophane crinkling and a deep golden sweetness seeping from between my teeth as I chewed and worked. Another half-sister, Troy, dug out a letter my father had written to her son with an outline of his hand: Someday, he had written, your hand will be this big. Barely breathing, I held my hand against it. Mine was much smaller. For the next two days, I was swept into the hubbub of a big family so unlike my own, which had been mostly just me and my mom, until it was mostly just me. And at the end of the weekend, the whirlwind tossed me back out to my ordinary existence, punctuated by occasional contact with one of my half-siblings. As generously as my new-found half-siblings shared my father with me that weekend, I remained hungry. I felt like he was their father, and I fed on the crumbs of their memories. Nearly a decade later, just over a year ago, Troy came through town and we met for dinner. I wasn’t even sure that we would talk about my – her – our father. I didn’t know what to ask, and I didn’t know if she would volunteer. But when we finished our food, stories poured out of her. Like me, Don had grown up without a dad. He was the youngest of seven kids, deserted by their father during the Depression in tiny Palestine, Texas. At eight years old, he was working in the fields. After a few hard-earned years of college, he started the first of a long string of businesses: a burger stand, then billboards, then insurance. When the Federal Communications Commission decided to release the last AM radio frequency in Texas, KEYH, in the early 1960s, he beat out the richest families in Houston to get it, selling himself on his then-unheard-of vision of an all-news radio station (despite his complete lack of experience in news). His reporters won awards for their investigations, but all-news radio was so novel that the station never made much money. In the meantime, he’d become deeply involved with minority communities in Houston, starting an Optimist Club for black people and a chapter of the Special Olympics. Houston had hundreds of thousands of Hispanic residents, with no citywide radio station to serve them. He converted his to all-Spanish language, and it became the number-one radio station in Houston. Though he loved inventing businesses, the daily work of running them bored him. He got in trouble with the Internal Revenue Service when he traded radio advertising for goods and didn’t count the trades as income. His insurance company did well until a series of natural disasters in Texas in the early 1980s. When the bankruptcy liquidator claimed he’d used money from that business to prop up another, he ended up in a legal battle that he ultimately won but that exhausted him. So his great successes were followed by great failures. He looked like a typical Texas man with his 10-gallon stetson, Cadillac and cowboy boots, but he lacked a taste for hunting or golf, and remained on the outside of the good-ol’-boy clubs. The Christian Science church was his only community – as a smart, ambitious, penniless boy, he had loved both its intellectualism and the wealth of its members – and he became one of its leaders. Before I came along, Don and his wife would see my mother and her husband at church every Sunday. Don and my mother worked together to establish a new branch of the church in Texas City, walking from house to house as they passionately discussed how to appeal to its poor black population – all the while, falling in love. Don had, of course, never told Troy what the secret relationship meant to him, but from her memories of the two of them, she thought they were well-suited, perhaps even sharing a great love. My mother had told me that, during the three years of their affair, she’d reworked her life, intensely seeking God. Before meeting Don, she had dropped out of college to marry at 18, working as a secretary until my sister, Robin, was born. When she couldn’t get pregnant a second time, she adopted my brother, Ty. She kept house and tended to the children. The confines of her proper life cut deep, and she was convinced that a clear-sighted, principled search for God was the way out. Entering her house, the first thing one saw was a sign that said THINK (with IBM in small letters below). Don was the first person she’d met who thought as deeply as she did, who believed as passionately that principle and spirit underlay the world. She longed to become a Christian Science healer, guiding the sick to health through prayer. My father promised to use his influence to help her succeed. I was six months old when my mother left her husband. But my father stayed with his wife, who learned of the affair a couple of years later. Don denied I was his child, and she believed him. Still, she insisted that they move a distance from my mother to a ranch in the country. My mother began working as a Christian Science healer, but when she refused to hide my origins, she was shunned within the church. She also became estranged from her family, especially, rumour held, as I grew to look more and more like Tricia (though I suspect the roots went deeper). Eventually she began to physically abuse her children, mostly Ty. The loss of her lover, the dissolution of her life, and her isolation had to have contributed, though those circumstances fall far short of an excuse or explanation. Robin has wondered if she had a personality disorder, and this might be true – but to me, a label makes her actions no less inscrutable. The word ‘crazy,’ with all its coarseness and impenetrability, feels more accurate. When I was nearly five, she moved us to San Diego to get a fresh start, but ocean and sun couldn’t cure what ailed her. She got by without working, from family money I think – a blessing that was also a curse, continuing her isolation. When I was seven, she sent Robin, then 15, to a boarding school during the school year and to my uncle during holidays; Ty, age 10, she gave up to foster care. His adoptive father (her husband when I was born) found him and brought him home to live with him a year later, but Ty was gone from my childhood. ‘Now I have all my energy for you!’ she told me when they left, and I wriggled like a puppy, despite a shiver of infidelity to my brother and sister. A few months later, I looked back with disgust at my naivety: all her energy also meant all her intensity. When I was 10, we argued one day because I was somehow failing to meet her incomprehensible needs. She said, as she often did, ‘You don’t have to do it. But if you don’t want to, you have to tell me. Then I’ll know what I need to know about you.’ The ‘it’ was always unclear, but the implied threat was apparent. Something broke in me. I was tired, tired, tired of scrabbling to figure out how to make her happy, and failing. ‘I don’t want to do it,’ I told her. ‘Send me away.’ I had already envisioned the future — packing up my belongings, moving to live with my uncle whom I barely knew, exchanging awkward letters with my mother. But she didn’t send me away, and she never said that again. Despite the underlying threat, I never doubted her devotion to me or her conviction that I was wonderful. The independence and freethinking I inherited from both my parents led to endless conflicts at school, and she advised and advocated for me so unfailingly I never questioned whether she would take my side. She once looked at me, stroked my cheek, and said, ‘You have such beautiful skin.’ It had never occurred to me that skin could be more or less beautiful, and I studied myself in the mirror afterward, absorbing that new fact about myself. I grew up with the tremendous gift she failed to provide her other children: I knew I was deeply loved. Halfway across the country, my father was always working on projects at his ranch, hauling his kids up at seven each Saturday morning, crying: ‘Time’s a-wasting! We’ve got lots to do!’ He’d sit on the porch swing with Troy for hours and talk, planting ideas. Ever thought of holding a horse show, he asked her when she was a teenager. What steps would it take to start one? And then a couple of weeks later: Thought any more about that horse show? What about a series of horse shows? What about putting together a brochure for them and selling advertising? Troy ended up doing all of that, running horse shows at 16. This story left me looking down at the table blinking hard, imagining an alternative reality with my own young legs swaying on that porch swing, my voice singing out answers to my father’s questions. Just before Don died, around the time I called, his life fell apart. His latest businesses had failed and his wife had finally left him. Still, he had new business ideas that were, as usual, ahead of their time: for one, he unsuccessfully tried to sell the idea of cogeneration power plants to Kenneth Lay at Enron a decade before they made Enron many millions. He also had a non-paying project, a plan for businesses to provide at-risk kids with mentors throughout their school careers. In December 1990, my father remarked to Troy’s husband: ‘If I die now, I’ll die a happy man. I’ve already lived the life of seven men.’ A week later, he had a seizure, and he insisted on no doctors, no ambulance, no hospital. He was ready, he said, and he died that night. He might have felt complete, Troy told me, but he was also just tired. Of course, that meant he felt complete without ever knowing me. Troy’s view is that my father had an impossible problem: he saw himself as an upright man, but he had fathered a child from a long, intense affair. He was committed to his five existing children and his wife who had stuck by him for decades, but she could neither connect with the parts of him that my mother had, nor handle my existence. What’s the moral thing to do? He made his choice. Had he lived longer, Troy said, she was certain he would have gotten in contact with me. When I called him, his desire to reunite with his wife made my very existence dangerous for him. But Troy’s mother was done, not coming back. My oldest half-sister Carol, on the other hand, sees our father’s rejection of me as an extension of his hypocrisy – his desire to appear to have a perfect family despite his philandering. He wouldn’t have acknowledged me, she says, as long as it challenged his outward image in the world. The two views aren’t incompatible and, regardless, my half-siblings insist my father and I would have taken great pleasure in one another. We have the same kind of mind. Gaining this knowledge of my father made me feel his absence more acutely just when I felt his presence most strongly. When I was young and someone asked me who my father was, I’d say: ‘I don’t have one,’ and I felt annoyed when the questioner persisted. Sure, some sperm had joined with an egg to produce me, but it felt more true to say that, like Athena, I had sprung full-grown from my mother’s head. My relationship with my mother was so consuming that there was hardly room for another parent anyway. But learning all this, I realised that I had always needed my father. Most especially, I needed to love my father. Deep within my psyche, there was a vacuum that only he could fill – he was gone, but his image grew in my mind, and it was one I could love. A few months after my conversation with Troy, I got married, and astonishingly, all my half-siblings came: all five on my father’s side, Robin, and even Ty, whom I’d seen only twice since I was seven years old. I, the girl with nearly no family, got married surrounded by siblings. 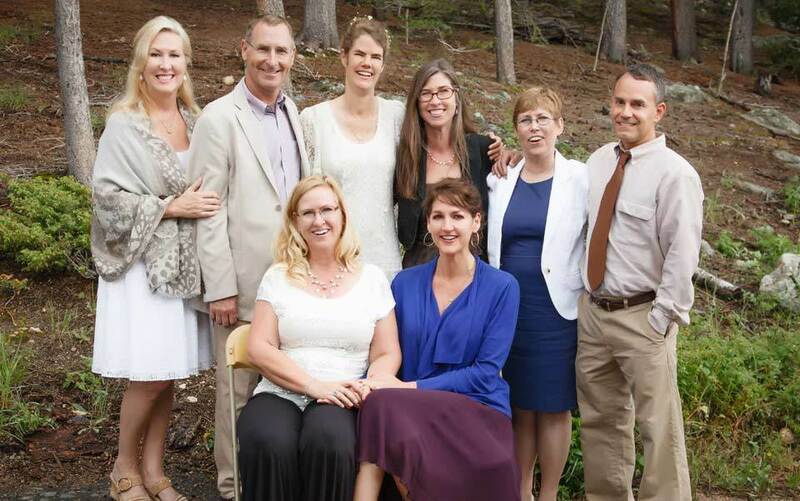 The photograph of the eight of us together for the first time still feels like a simple miracle. Wes gave a toast, his voice rich and full: ‘Your father would have been so proud of you.’ All my siblings smiled. Never had I realised how much I’d longed to hear those words.